As a result of OCD I just completed an installation of the fancy *** Euro flash to pass left control. First, thank you to Eric for the pin out and your write up on the install. It would have taken me a lot longer if I had to also trace the wire swap myself. While the straight across swap is simple, OCD made mine a bit more involved. After I got all the wires rearranged and tested the different circuits I found that the front turn signals lacked the running lights. Apparently some or all Euro SH don't have this feature. Maybe someone can verify this point. I could have left it as is, but as I spent the time and money to install GSXR mirrors (they have integral turn signals) and a 2 to 3 wire mod to retain the running light feature of the stock SH, I wasn't done yet. For anyone that wants to do the pass to flash mod, here is what I did. Disassemble the control to expose the turn switch contacts. That is, just remove all the screws holding the internal components in the lower half. Don't remove the screw that the turn signal switch pivots on. That's the one you can see through the hole in the formed metal piece that covers the inner, lower half on the control housing. Next remove the strain relief holding the wire harness to the control housing. 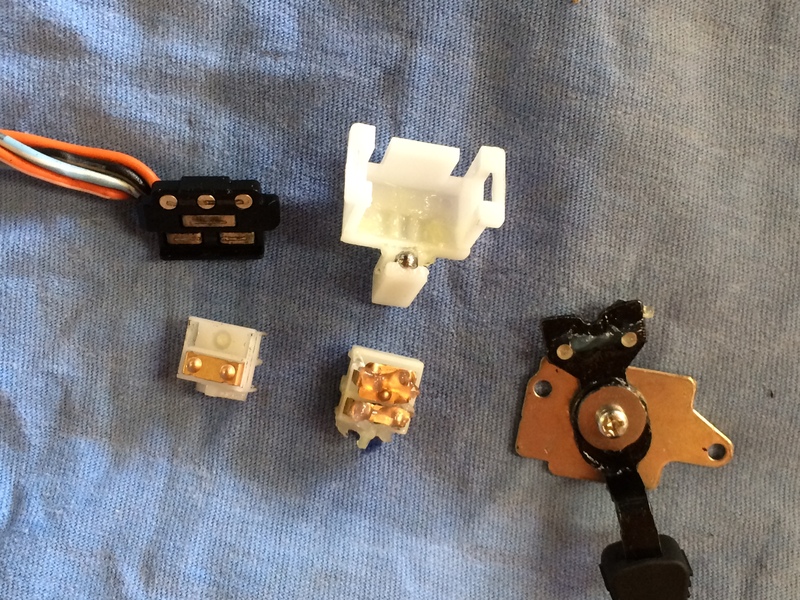 Once those parts are out of the way you will see the turn switch contact assembly. Remove the white plastic part which has a black plastic terminal on it. It will just slide out. Once you see the black terminal on the Euro control, you understand why the running lights don't illuminate. There are no wires from the terminal to supply power to the lights. This should have been obvious to me when changing from the Euro 6p connector to the US 9p connector. Two of the unused positions of the replacement 9p connector (see pin out) correspond to a O/W and Lb/W wires on the US bike control wires. The black terminal is the key component, but as it is not interchangeable, all that needs done is to remove the white plastic piece with the black terminal from both the Euro and US controls and swap them. To do this swap just pull the wires out of the loom and fish the others in. Push the "new" extra wires into the corresponding position in the 9p connector and presto-changeo running lights now work. Well almost. With that done, there are two other issues that need resolved. The simple route for the third eye light is to do as suggested here https://www.superhawkforum.com/forum...-lights-32695/ and simply ignore the brown wire coming from the Euro control (it's the switched power source for the third eye light on Euro bikes). 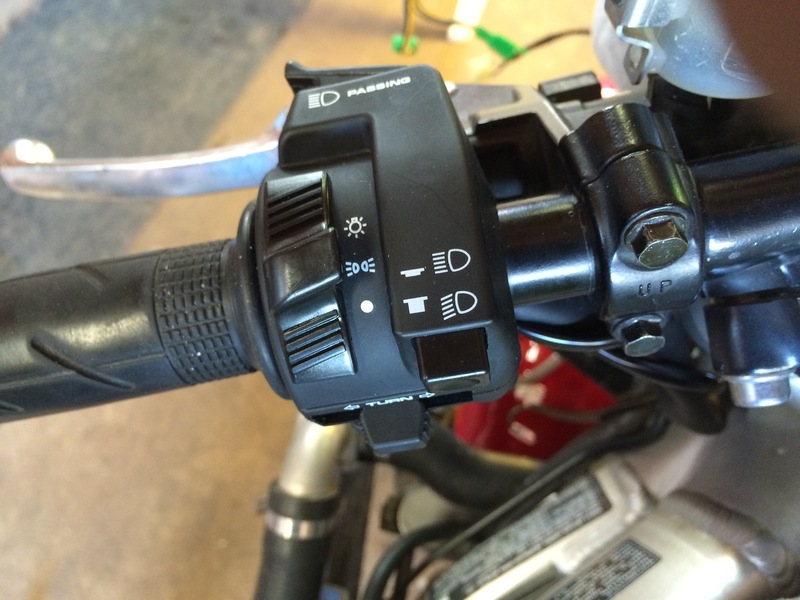 As the US bikes power the third eye differently, all that needs done is to just reconnect the original connector to the third eye and abandon the brown wire from the new fancy *** control. Now if you are OCD, and I know that you are, this is not good enough. Why is it not good enough? Because if you just reconnect the original wire to the third eye, the off function on your new fancy *** control will not turn off the third eye along with the head light. And that is what's not good enough. What to do? I picked out the brown wire from the stock third eye connector and installed a new wire that runs from the stock third eye connector to the 9p connector, crimped on appropriate terminal and used one of the still open positions on the 9p connector. Then just install the brown wire fron the control into a matching position on the 9p to the new wire you just installed. If you don't have the terminals and a proper crimper you can cut and paste with solder using the old terminals, but if your OCD, and I know that you are, you'll be repulsed by this method. The stock brown wire that is now unused, I cut the terminal off and wrapped it around the wire harness and taped it. 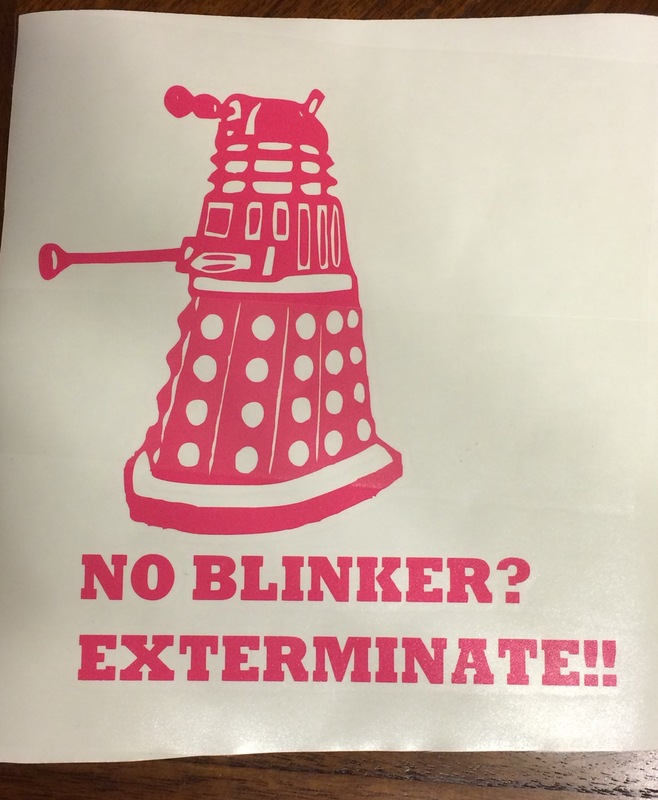 It could come handy for a future switched power source. AKA, future OCD. 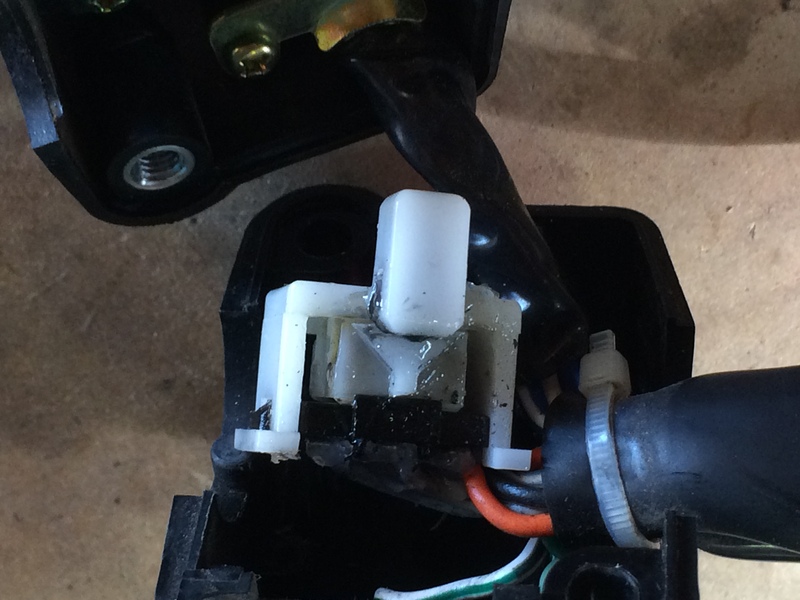 The second issue is that there is an extra Bl/br wire when you swapped in the turn switch from the US control. This needs to be connected to the Bl/Br wire that is still there after swaping of wires stated earlier. Shades of horror, I did a cut and paste with solder with the two Bl/Br wires. Pull back the loom a couple of inches strip off about 3/8" along the length of the insulation from one of the wires. Cut the end off of the other Bl/Br wire to match the position of the stripped area and solder. Button everything back up and go for a ride. You feel just like your in Euro land with your fancy *** pass to flash control. A couple of issues to note. First is check to see if the clutch lever rubs on the new fancy *** control. I had to re-position mine a bit to keep it from binding. Second, and I don't know if I'm missing something or if there is an error in the pin out diagram. The pin out shows a Green wire in the lower left corner. There is no corresponding Green wire on the main harness side of the 9p connector, and no Green wire in the wires coming from the control that goes to the 9p connector (there is a G wire that goes into and out of the 6p connector. 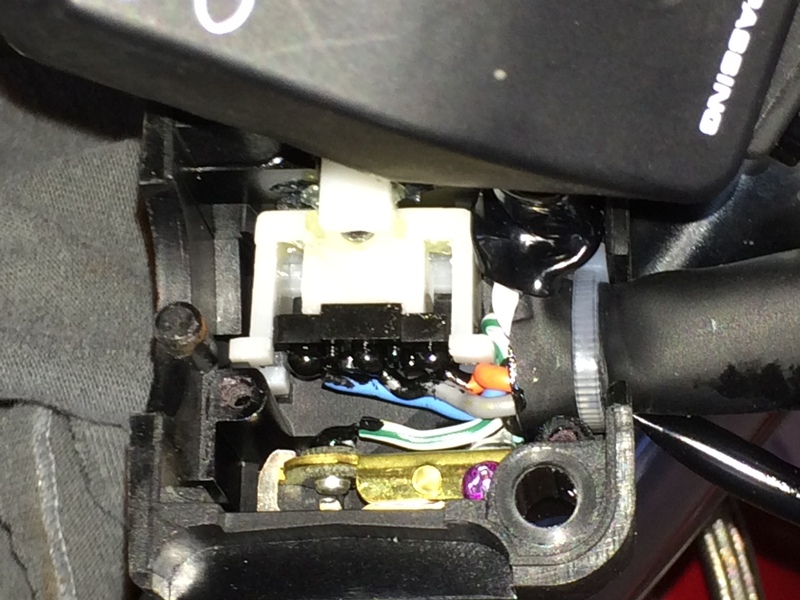 I have failed to mention that while figuring out how to deal with the turn/running lights switch issue I ended up disassembling both turn switches and having fun with tiny springs. One of which now resides in another dimension. I got lucky as there was a spring in a throttle/kill switch from a 954 that came with a brake master and clip-on I bought a while back and was the same size. front turn signals lacked the running lights... Apparently some or all Euro SH don't have this feature. Maybe someone can verify this point. This is the nearest equivalent to a running light, even then the switchgear means this feature is optional. Last edited by Wicky; 05-14-2016 at 01:25 PM. OK by me, but only if you don't vote for Trump or Clinton.